Media chases a car which came out from North Korean Embassy in Kuala Lumpur, Malaysia, Feb. 22, 2017. The Malaysian police on Wednesday said they want to question three new North Korean suspects, including a North Korean diplomat, in connection with the apparent assassination last week of Kim Jong Nam, the older half brother of North Korean leader Kim Jong Un. At a news conference in the Malaysian capital, Police Chief Khalid Abu Bakar said the new suspects include Hyon Kwang Song, the second secretary in the North Korean Embassy in Kuala Lumpur. The other suspects named were Kim Uk Il, who works for the North Korean airline Air Koryo, and a North Korean man identified as Ri Ji U, but no other details were given about him. Bakar said the suspects are still in Kuala Lumpur and police will compel them to cooperate if they do not come in voluntarily. Police have also asked Pyongyang to return four other North Korean suspects who are believed to have fled Malaysia to Pyongyang. “We believe they are heavily involved. So that’s why I requested the North Korean Embassy's assistance to trace and hand them over to us,” said Bakar. FILE - A still image from a CCTV footage appears to show a man purported to be Kim Jong Nam talking to security personnel, after being accosted by a woman in a white shirt, at Kuala Lumpur International Airport in Malaysia, Feb. 13, 2017. So far two women, 25-year-old, Indonesian Siti Aisyah and 28-year-old Vietnamese Doan Thi Huong, have been arrested, along with a North Korean man. The women are believed to be the assailants who ran up to Kim at the Kuala Lumpur International Airport and poisoned him by spraying him in the face with an unidentified liquid and holding a cloth over his face. Malaysian police on Wednesday dismissed claims made by family members of the Indonesian suspect, that she was paid to take part in a series of harmless pranks for a comedy TV show called “Just for Laughs,” that involved convincing men to close their eyes and then spraying them with water. However Malaysian Police Chief Khalid Abu Bakar said it is clear from airport surveillance footage of the attack that the two women knew they were handling a dangerous and toxic substance. “You see the ladies were moving away with their hands like this, towards the bathroom, towards the wash room. So she knew very well that it is toxic and she needs to wash her hands,” said Bakar. The Malaysian police chief said the alleged assailants knew they were not involved in a comedy skit but were part of a hit squad that practiced for this type of attack on two previous occasions. “From our investigation we now know that they have made a few exercises to do that,” said Bakar. The father of Doan Thi Huong spoke with VOA's Vietnamese service about his daughter’s alleged role in the death of Kim Jong Nam. "I couldn't know what she did," Doan Van Thanh told VOA Vietnamese. “We can't. She didn't even let us know where she goes. She did get home on January 25 and left four days later. “She left and we know nothing since then,” he added. 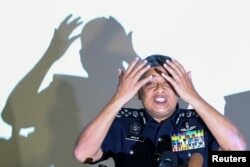 Malaysia's Royal Police Chief Khalid Abu Bakar demonstrates to the media during a news conference regarding the apparent assassination of Kim Jong Nam, the half-brother of the North Korean leader, at the Malaysian police headquarters in Kuala Lumpur, Malaysia, Feb. 22, 2017. Security has been increased at the hospital where the victim’s body is being held because Malaysian police said someone had tried to break into the site earlier but would not elaborate on the identities or motives of those involved in the break-in. The North Korean embassy has so far refused to cooperate, even to help confirm, with DNA samples and dental records, that the deceased was indeed the estranged half brother of the North Korean leader. Pyongyang has accused Malaysia of “colluding” with its enemies to carry out a politically motivated investigation. An embassy statement Wednesday rejected Bakar's account, questioning how the women would still be alive if they had toxins on their hands. The embassy called for the women to be released along with a North Korean citizen who was also detained. Authorities are still waiting for the results of the post-mortem examination of Kim's body, and are seeking his family members to provide a DNA sample. South Korea called Kim's murder “a terrorist attack.” Seoul’s National Intelligence Service identified Kim Jong Nam as the victim and said North Korean leader Kim Jong Un had issued a standing order to eliminate his half brother soon after he came to power in 2011. South Korean Unification Minister Hong Yong-pyo said this week that eight North Koreans were involved in the case and that the apparent assassination fit a long a history of North Korean terrorist attacks abroad and executions of officials considered a threat to the country’s leader. Youmi Kim in Seoul and VOA's Vietnamese Service contributed to this report.